In 1850, Isaac Singer introduced the first automatic sewing machine to be sold to homemakers and seamstresses for $10. Up to that point, sewing machines sold for hundreds of dollars almost exclusively to commercial businesses. Isaac Singer needed to create an entirely new channel to represent, demonstrate, sell and service his invention to a yet-to-be-developed consumer and small business sewing market. Isaac Singer personally recruited a range of new dealers and put together a “life-stage” management process to enable, train, motivate and measure dealer performance. 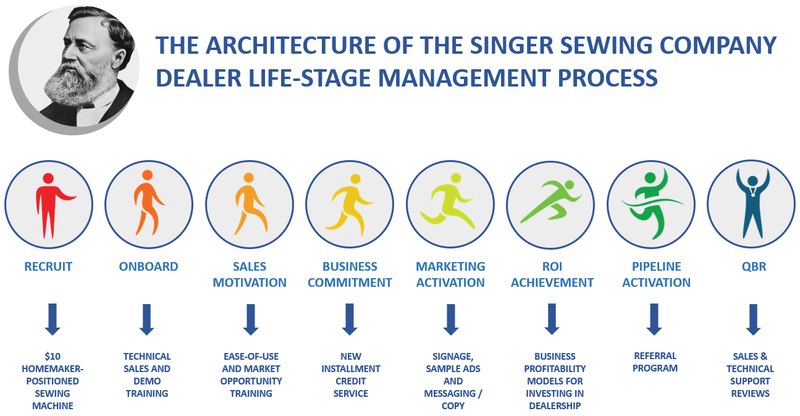 The Singer Sewing Machine dealer program was the first of its kind and provided a blueprint for the modern channel structure that is still used today. This dealer life-stage management process was inspired by the need to put existing and new entrepreneurs into the consumer sewing machine business. Isaac Singer’s vision for this management process was to provide a range of tools and resources to give potential dealers confidence in the Singer business model. By 1876, Singer had sold over 2,000,000 sewing machines through thousands of dealers worldwide. The dealer life-stage program, along with the excellent product, were the two major contributors to the success of Isaac Singer’s business. From the beginning, Singer made a commitment to the success of his dealers which gave them confidence to invest in growing their own sewing machine business. 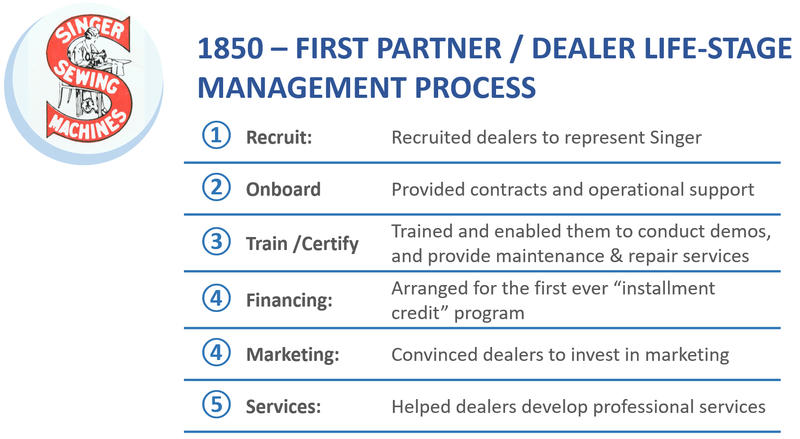 In 1850, this type of dealer support program was revolutionary. The Singer Sewing Machine Company was putting dealers into business with excellent support, marketing materials and training globally. One of the many transformational elements introduced was the first-ever installment credit service. This enabled dealers to sell a $10 sewing machine to consumers on credit to dramatically widen the market potential and accelerate sales. Singer was even able to overcome dealer worries about investing in local marketing activities because they were concerned that the benefit may go to them or other competing dealers. He was able to convince dealers that it would build the overall market and, in-essence, build belief in the concept that “a rising tide raises all ships.” Dealers were motivated, committed, and invested in growth because they were successful. The Singer / dealer relationship was one of the best examples of a producer and its indirect channel achieving perfect alignment. Why Have VPs of Channels Today Forgotten the Lessons of Isaac Singer? With overwhelming evidence that a supported channel is a committed channel, why then have VPs of channels today forgotten the important lessons that Isaac Singer taught the world over 160 years ago? 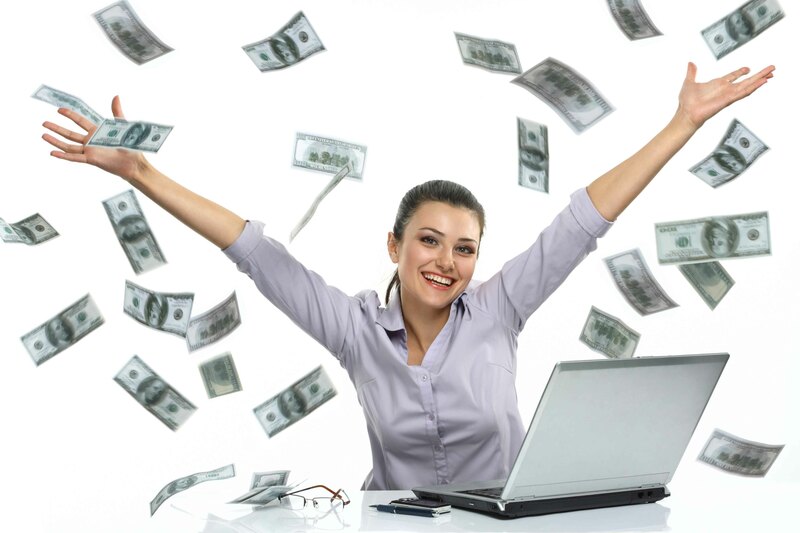 Perhaps many current channel executives have never heard of the Singer channel success story and its blueprint for success. Or perhaps this was a different time and a different set of circumstances. But there was a universal truth from the Singer channel development experience. Key Lesson from the Singer Channel Strategy: A supported, enabled, effective, and profitable channel will far outsell a direct-only sales strategy. 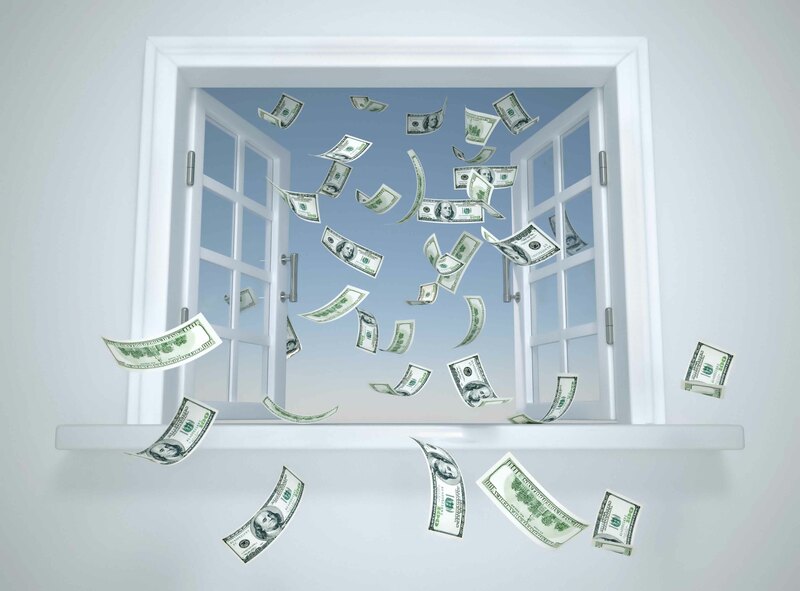 There is a lot of pressure on VPs of channel sales to deliver quarterly revenue targets. Quarterly targets test our commitment and dedication to partner life-stage activation and enablement. Too often, when sales targets get tight, channel VPs will modify a channel enablement strategy to a direct sales strategy to help close short-term deals. The problem is when channel sales leaders default back to a direct sales orientation, this takes the emphasis away from building an independent partner-led channel. This lack of commitment to your partners will lead to a channel that becomes too reliant on the producer sales team. High growth channels, including the Singer Sewing Machine Company, are built on a commitment to professional partner life-stage development. Two key methods for gaining higher partner commitment levels are life-stage scorecard systems and business plan / QBR systems. 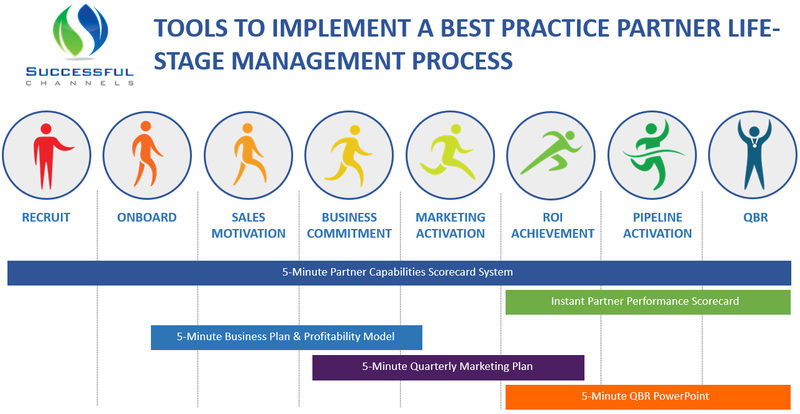 These tools guide partners and Channel Account Managers through a structured, repeatable, and effective partner life-stage management and performance measurement processes. They are designed to achieve the same thing that the Singer Sewing Company was able to accomplish with their dealers 160 years ago – a tangible expression of the producer’s commitment to the success of its dealer / partners. 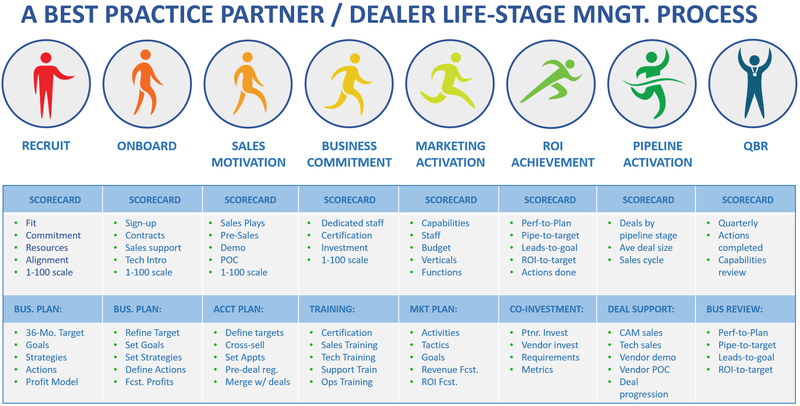 Partner Scorecards: Each partner life-stage has a unique set of relevant scorecard metrics and to-do items to effectively enable and activate partners to produce at a high level. Partner Joint Business Plans: Each partner life-stage has a relevant set of goals, strategies, actions and targets that are appropriate for building partner commitments and performance measurement. The highly successful Singer Sewing Machine channel strategy taught us that a commitment to partner life-stage activation, management and measurement will yield much greater partner satisfaction and commitment levels. At Successful Channels, we have found that channel organizations that use our 5-minute, cloud-based, CRM-integrated tools regularly execute life-stage scorecards, business plans and QBRs grow at 10-25%+ vs. prior year vs. partners that do not. It sure seems like a lot of work to support eight different partner life-stages, particularly if each partner is at a different stage resulting in a totally different set of tasks. It is hard to imagine how a channel manager can effectively manage these tasks without the help of life-stage management scorecards to target and track the right activities to the right partner. This work has to be automated, organized, and streamlined so channel managers and partners can work together to create productive, revenue-producing, and profitable representatives for your brand. Here are a range of tools that are inspired by the Singer Sewing Company channel strategy. They enable channel managers to develop high-growth partners that are strong and independent representatives of your brand. The key to reaching the same level of channel achievement as the Singer Sewing company is making partners feel supported, capable of succeeding, and profitable. Channel teams can gain strong commitments from your partners to invest in your brand with the use of joint business planning and profit modelling tools. Finally, it is equally important to measure performance-to-plan to celebrate successes and schedule improvements while keeping your brand at the top of your partner’s mind. These tools are designed to help your channel managers become excellent enablement and growth consultants to your partners at each life-stage in-order to get the most out of the relationship. If Isaac Singer were still here today to advise channel VPs of sales on improving their strategy, he would likely say that they need to start with supporting their partner’s success. Provide them the tools and programs necessary to be successful and demonstrate to them that their success is the number one priority. Unfortunately, channel VPs of sales don’t take this advice often enough. A good illustration, (if a little long), of the fact that vendors need to add value to gain partner commitment. If both parties see value in each other, then it is the basis for a true partnership.